Anger: an emotion that often drives people to walk into a school, movie theater, place of business or nightclub, pull a trigger and kill innocents. Anger: an emotion linked negatively in Bible verses with sin, unrighteousness, the devil, slander and malice. Anger: an emotion to be avoided, tamed, tamped down. What about our own anger, though, when it feels justified? Especially in the current political climate, what about the anger of millions of Americans toward elected representatives, who don’t seem to be able (or want) to solve our social problems? What about our anger toward people who appear greedy, toward rapists, thieves and murderers, or toward people we don’t agree with, even our own family members and friends? Do we deny our anger and try to be sweet to everyone while we seethe underneath? Let’s explore the possibility that anger can be an emotion we can live with and appreciate, and that anger does not necessarily lead to violence. 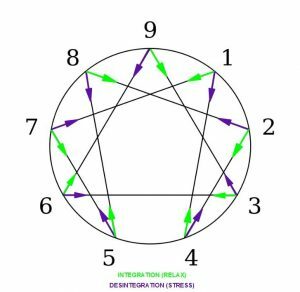 As we saw previously in our post on fear, the Enneagram system can be very helpful in this discussion. The following quotes and diagrams are taken from the Enneagram Institute online. That is, a One will “disintegrate,” mainly when stressed, to the negative aspects of the Four; the Four will “disintegrate” to the negative aspects of the Two; etc. When we are growing psychologically and/or spiritually, the Eight will “integrate” toward the positive aspects of the Two; the Three will “integrate” toward the positive aspects of the Six; etc. Let’s now take a closer look at the Instinctive Center, where Anger or Rage is the primary emotion. Quoting again from the Enneagram Institute, “Thus, each type has a particular way of coping with the dominant emotion of its Center. In the Instinctive Center, Eights act out their anger and instinctual energies. In other words, when Eights feel anger building in them, they immediately respond to it in some physical way, raising their voices, moving more forcefully. Others can clearly see that Eights are angry because they give themselves permission to express their anger physically. “Nines deny their anger and instinctual energies as if to say, “What anger? I am not a person who gets angry.” Nines are the type most out of touch with their anger and instinctual energies, often feeling threatened by them. Since Eights are those who present themselves as the angriest – and are thus perhaps the people who appear most threatening to others, and potentially more violent – let’s look more closely at the Eight personality type. Taken to extremes (that is, when the Eight “deteriorates” due to stressors), the Eight can become confrontational, vengeful, explosive, destructive, intimidating and even violent. They can stop caring for others and become callous, even confronting others when it would be in their own self-interest to cooperate. perhaps most importantly, the Enneagram assists us to grow psychologically and/or spiritually when we are able to learn about the other types and pay attention to our own “integration” and “disintegration” directions. In the case of the Eight, his or her traits can and often do lead to an impassioned striving for justice, not only for him/herself but also for the oppressed and marginalized. (On the negative side, the Eight can easily fall into the trap of looking at almost every situation from the standpoint of justice; when an Eight gains self-insight, he can start realizing that justice is only part of the issue and must be tempered with love, gentleness and compassion – that is, the positive traits of a healthy Two.) The Eight’s leadership abilities can persuade others to join a worthy cause, and her autonomy and independence can allow her to take risks when others might not be able to. The Eight’s directness can be a real asset when honesty is needed, and his decisiveness can move a project forward in the face of others’ hesitancy. Someone who identifies as an Eight, therefore (take the Riso-Hudson Enneagram Type Indicator to see which type is yours), can not only learn a lot about herself and how she fits into the world but can also find ways to channel and use her gifts and instincts in the service of the common good. She can consciously look at the Two type (her integration point) and work toward developing the Two’s positive traits. Similarly, if we suspect we are dealing with an Eight in a work or social situation, especially if our colleague is angry and productive but not necessarily violent or out of control, we can better appreciate the other’s anger or assertiveness and see how it might be used to further just ends. As we Americans navigate a chaotic, unpredictable, often dangerous and violent world and country, we can begin to see nuances in people’s anger. Using the Enneagram, we can start to distinguish between and work with righteous anger that eschews violence and destruction versus self-serving, narcissistic rage – perhaps dictated by a racist or xenophobic worldview – that seeks to destroy the common good. It is vitally important that we not automatically view every angry person as violent or potentially violent: if the person is an average or above-average Eight with many other positive traits, it is likely that her anger is righteous and justice-oriented. We need all types of people to make a better world. 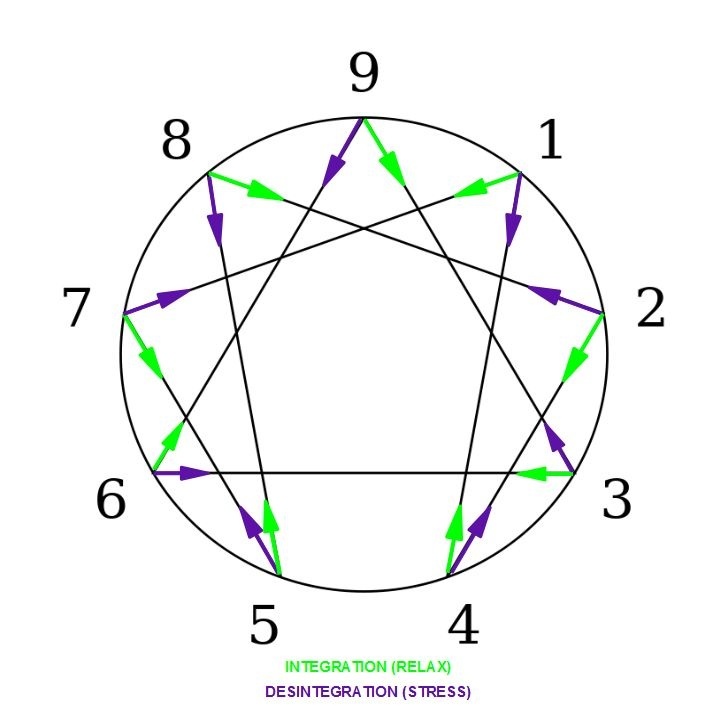 I would encourage studying and working with the Ennegram, not only for self-enlightenment but also for mutual understanding and in the interests of social justice. Riso, Don Richard and Russ Hudson. The Wisdom of the Enneagram. New York, etc. : Bantam Books, 1999. Thanks for putting in a word for righteous anger! As a likely Eight, I’ve often found that other types (what would be called Feelers in MBTI) often find me too intense. It’s just because I care, and my anger at the many injustices of our world is certainly not directed at my friends. Nevertheless, I’ve had to learn how to tone down my flame without extinguishing my light altogether, which is not easy. For a while, I just found it depressing, but I’m starting to revive by using humor to get my point across, instead of anything that could be construed as “angry” by a sensitive reader. Thanks for your thought-provoking essays!